VAT investigations are typically triggered either if a routine VAT inspection uncovers irregularities, or as a result of out-of-pattern declarations and repayment claims, or if you operate in a sector deemed “high-risk” by HMRC. Depending on the severity of the suspected offences, HMRC can choose to exercise their powers under the Civil Investigation of Fraud procedures or, in the most serious cases, to launch a criminal investigation. Successful prosecution of criminal cases will normally result in imprisonment. Intervention by HMRC can be initiated by pre-notification of an enquiry at one end of the scale, to an unannounced on-site inspection at the other. You may be required to produce relevant documents for inspection and potentially for removal by HMRC and to attend interviews. We strongly recommend that you contact Lindsay as soon as you are made aware of HMRC’s intentions, so that you are properly represented at every stage of the process. 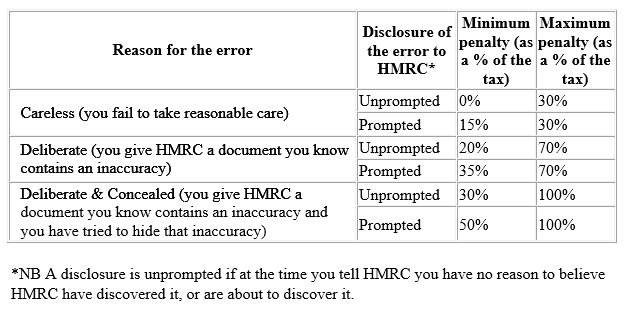 On conclusion of their investigation, HMRC will issue you with an assessment of the VAT understated or over-claimed, together with a proportionate penalty. The applicable penalty rates are detailed in the table below. With our expert tax advisers representing you, there may be opportunities to reduce the proposed penalties or structure a more favourable payment plan. The penalty rates for an inaccurate VAT Return depend on why you made the error. The more serious the reason, the greater the penalty can be. The penalty is calculated as a percentage of the tax unpaid, understated, over claimed or under-assessed, as a result of your errors. You will also have to pay the VAT and any interest due in addition to the penalty.